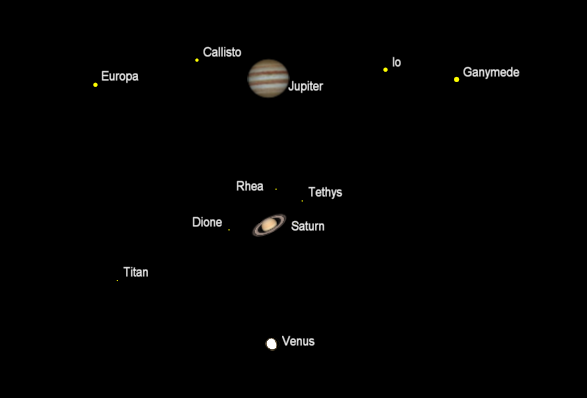 Ephemeris for Friday, March 29th. Today the Sun will be up for 12 hours and 36 minutes, setting at 8:06, and it will rise tomorrow at 7:27. The Moon, 1 day past last quarter, will rise at 5:03 tomorrow morning. The most interesting star in the Big Dipper is Mizar and its dim companion Alcor. It is the second star from the end of the handle, where the bend in the handle takes place. Folks with good vision can see the dimmer star right next to Mizar. In ancient times it was used as an eye test for visual acuity for warriors. As such it was known as the “Horse and the Rider”. Mizar is second magnitude, in the second rank of star brightness invented by the Greek astronomer Hipparchus in the 2nd century BC. He ranked stars in 6 classes, from first magnitude for the brightest to 6th for the dimmest visible to the naked eye. Alcor comes in at 4th magnitude. It does suffer a bit by being very close to Mizar which is 6 times brighter. Ephemeris for Thursday, March 28th. Today the Sun will be up for 12 hours and 33 minutes, setting at 8:05, and it will rise tomorrow at 7:29. The Moon, at last quarter today, will rise at 4:21 tomorrow morning. The Big Dipper is climbing up the northeastern sky at 9:30 in the evening, it’s seven stars shining brightly. The Big Dipper is not an actual constellation, recognized internationally. It’s part, the hind part, of Ursa Major, the great bear. The Big Dipper is an asterism or informal constellation. It is a distinctly North American constellation. For fugitive slaves, fleeing the southern states in the days before the Civil War, the Drinking Gourd, as they called it, showed the direction north to freedom. In England the dipper stars become the Plough, or Charles’ Wain (Charlemagne’s Wagon). In France, known for culinary delights it was the saucepan, or the cleaver. Many cultures saw what was familiar to them in these seven bright stars. Cultural views of the Big Dipper as an Animation: Big Dipper/Sauce Pan, Plough (plow), Charle’s Wain (Charlemagne’s wagon), Cleaver. Ephemeris for Monday, March 25th. Today the Sun will be up for 12 hours and 24 minutes, setting at 8:01, and it will rise tomorrow at 7:35. 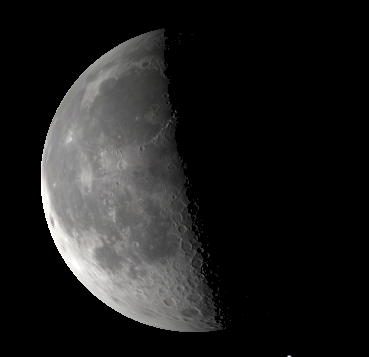 The Moon, 3 days before last quarter, will rise at 1:37 tomorrow morning. 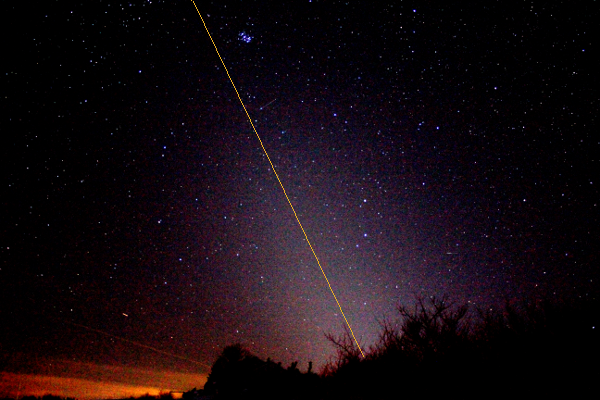 With the bright moon out of the sky for nearly two weeks it’s time to look for the zodiacal light. It’s is a faint but towering glow that can be seen after the end of astronomical twilight on moonless nights. It is seen in the west in the evening in late winter and early spring and in the east in the morning in late summer and early autumn. The axis of the glow is the ecliptic, the apparent annual path of the Sun in the sky, along which lie the constellations of the zodiac. Right now the end of astronomical twilight is about 9:45 p.m. and advancing at a rate of a minute or two each night. Go to a spot with a dark western sky, no big cities or towns out that way. Zodiacal light is caused by dust spread out around the Sun. Much enhanced Zodiacal Light from the my back yard at 9:31 p.m. March 16, 2018, 5 minutes after the official end of astronomical twilight. 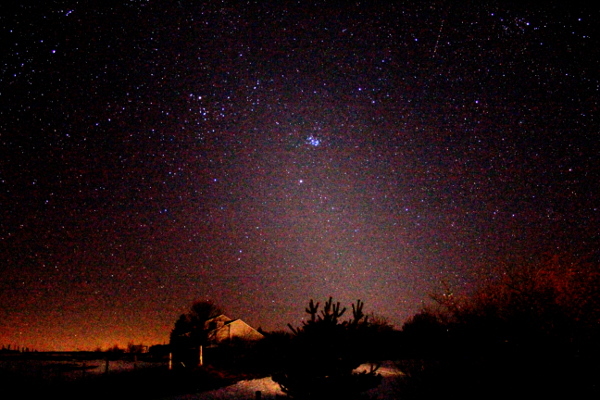 Note the Pleiades top left of center and the constellation of Ares below and right of center. Canon EOS Rebel T5 18mm f.l., f/3.5, 6 sec. ISO 12,800 . The clouds on the left appear to be illuminated by the lights of the towns of Beulah and Frankfort 20+ miles away. I’ve added the approximate ecliptic line from a Stellarium view of the same date and time.